For Christmas we received a shipment of Omaha steaks. The shipment contain a wide variety of steaks, also pork chops, Chicken breast and hamburger patties. We must have gotten 20 steaks all total, and I have been experimenting with all kinds of different recipes, as well as ways to prepare these steaks..Some of the recipes have been amazing and of course some recipes have been disappointing. 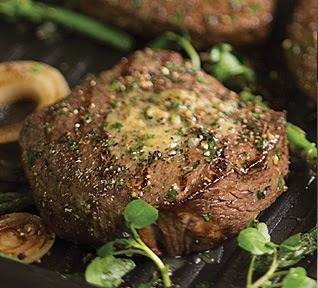 This recipe I have posted here for steak Diane I think is exceptional, and I have to say that all the Omaha steaks we received were very tender and juicy. This recipe could however enhance maybe a steak of lesser quality. 1 Season both sides of steak with salt and pepper. 2 Melt 2 Tbsp. butter in a heavy skillet; add mustard and shallots. saute over medium heat 1 minute. 3 Add steaks and cook approximately 3 minutes each side for medium rare. 4 Remove steaks to serving plate and keep warm. 5 add into pan: drippings, 1 Tbsp. butter, lemon juice, Worcestershire sauce and chives. 7 Add brandy, pour sauce over steaks Sprinkle parsley over the top. This is one of my favorite meals every!! Thanks for stopping by Saturday Dishes Valentine's blog hop and linking this up. I pinned it! I always struggle with preparing steak but my husband loves it! So glad you linked this up to Saturday Dishes! Pinning. How cruel, I'm sitting at hockey practice now craving steak diane! Thanks for sharing at Inspire Us Thursday on Organized 31. My mouth is watering over your Steak Diane Recipe. I can't wait to try it. Thank you for sharing with the Clever Chicks Blog Hop! I hope you’ll join us again next week!